Cheating is tempting when you see everyone else doing it, but Fred, 17, has chosen not to. "The day before our art history final, the teacher gave us the class period to study. As we studied a million and one flashcards, my classmates and I felt the weight of the test approaching. Then one of my classmates said he hoped that the student who sat next to him would come the next day. 'I need to cheat off of them,' he said." With interviews with a college admissions counselor and high school teacher about cheating. Want to spend five weeks in China? Live through Sam, 13, who tells us all about his adventures while vacationing there. If you want a chance to see some of the famous art you learn about in school up close and in person, Nidia, 17, recommends going to the Getty to see this show. The sequel to last year's surprise Disney Channel musical sensation mostly lived up to the hype, said Charlene, 14. The mysteries are answered in the awesome, action-packed final installment of J.K. Rowlying's epic series, says Se, 16. Don't worry, NO SPOILERS HERE!!! Helen, 17, enjoyed every minute of the Simpsons' adventures on the big screen. The concert featuring My Chemical Romance, Linkin Park and many other rock bands was amazing, says Nattalie, 16. Want delicious breakfast and lunch food in a cute (Coca-Cola bottle vases) setting? Chelsea, 14, suggests trying Auntie Em's Kitchen in Eagle Rock. Oh what a night! Victoria, 17, loved Jersey Boys, the funny and touching musical about the careers of Frankie Valli and the Four Seasons. With the same great chemistry and humor along with new spectacular new action scenes, Rush Hour 3 is a worth follow up to the other hit movies, says Jennifer, 17. Francisco's comic shows that the much-hyped iPhone might not be all it's cracked up to be. It started out torturous, but Charlene, 14, found out that she was more productive when she gave up television. After years of wishing she were taller, Samantha, 17, now embraces being only 4 feet 9. Check out a video about L.A. Youth on YouTube. It should have been an inspiring and tragic story, but the biopic about salsa pioneer Hector Lavoe instead left Jennifer, 17, just depressed. Sam, 13, found delicious salads, healthy sandwiches and extraordinary pizzas in an expected place. 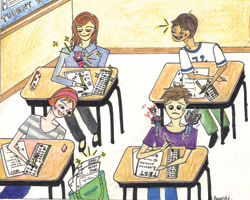 Graphic novels are interesting stories that helped Lily, 17, escape problems at school. With a list of Lily's Top 5 graphic novels. With summer job hunting just around the corner, Francisco, 15, created this comic strip about working in a fast-food restaurant. Despite her religious beliefs, Hae Jin, 17, thinks abortion and gay marriage should be legal. The exciting action and special effects make the latest movie in the series the best yet say, 14-year-olds Sam and Gabe (in separate reviews). The musical stylings of The Klaxons transformed Leslie into a crazy fangirl at their recent concert.